Guys, this soup is so amazing. It is one that I will make over and over throughout the colder months because it is just so hearty, comforting and scrumptious. And, it's ultra easy to make. I actually developed and spent time testing this recipe back in July and August. I often prepare recipes out-of-season/pre-season so that the posts for those recipes are "live" on the blog in-season. Since I prefer to test a new recipe several times before posting it, I often find myself making Christmas treats, for example, in October and November. In this case, it was soup in August. I am looking forward to enjoying this soup a lot more, however, now that cooler weather is upon us. It's a soup deeply rich in flavor, but requires mere minutes of hands-on preparation. 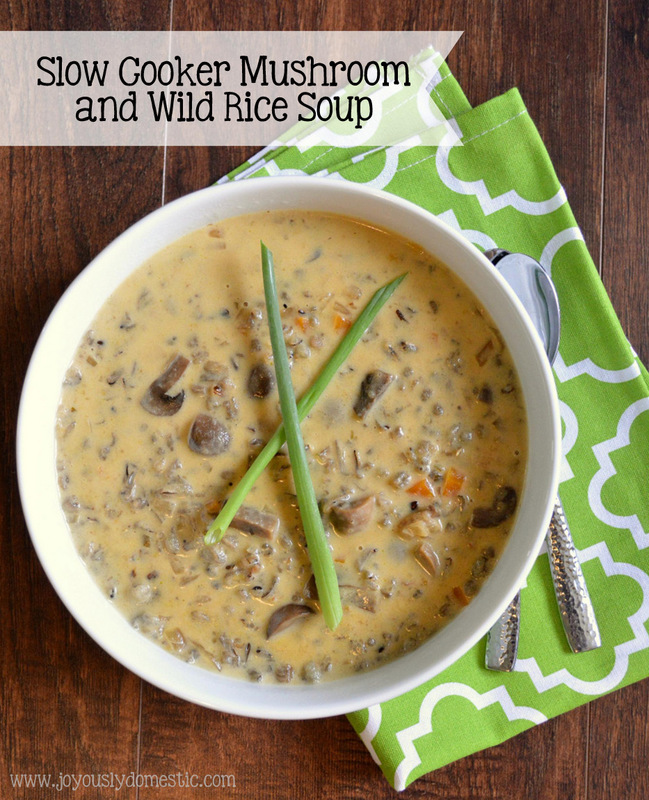 The wild rice's chewy, hearty texture is enhanced here by the luxurious, creamy and silky broth while the mushrooms bring an earthy, deep flavor to the soup. Imagine cozying up on the couch with a mug of this hot, creamy soup during the blizzard-y, bitter cold months of winter. Pure comfort. NOTE: You can use a variety of mushrooms or one type that you particularly like. I use basic button mushrooms. Add all ingredients except heavy cream to 5 - 6 quart slow cooker. Stir to combine. Lid and cook on low for 7 - 8 hours. Remove lid and add in heavy cream. Lid again and cook for 15 - 20 additional minutes on high to allow soup to come back to temperature. Check and adjust for seasonings. This was so easy to make and was just delicious. I made it for a friend who had just returned home from having surgery. She and her husband really liked it. I will be making this again. Wonderful flavors. I did change to portobello mushrooms as I like their flavor.